Dissatisfied with the unsettled state of Europe, Wertmuller came to Philadelphia, in the year 1795. He had been painter to the King of Sweden, and had gained some celebrity by Pictures of Poetical and Mythological subjects, his most recent one being a Danae. Our custom-house then made no distinction in favor of the Arts, and Mr. Wertmuller found himself embarrassed by the excessive charges of duty on his Paintings. In this dilemma, he was advised to apply to my father and me, and we succeeded in getting him through, by the payment of duty on a low estimate, as I contended that his pictures, though highly valued by him, would not bring at auction more than five hundred dollars. Thus relieved, he procured lodgings, and commenced as a portrait painter. His large paintings, though highly finished, were not much admired, and he was chiefly employed in small portraits, for which he was better calculated, being near sighted; and in these his high finishing was better appreciated. His Danae was admired by the few persons in Philadelphia that talked about painting; but nobody thought of purchasing it, partly repelled by the subject, which was abhorrent to their Quaker sentiments, and by the high price put upon it, as his masterpiece — having, with unmeasured time, lavished on it all the resources of his art. It was certainly a beautiful and brilliant painting. 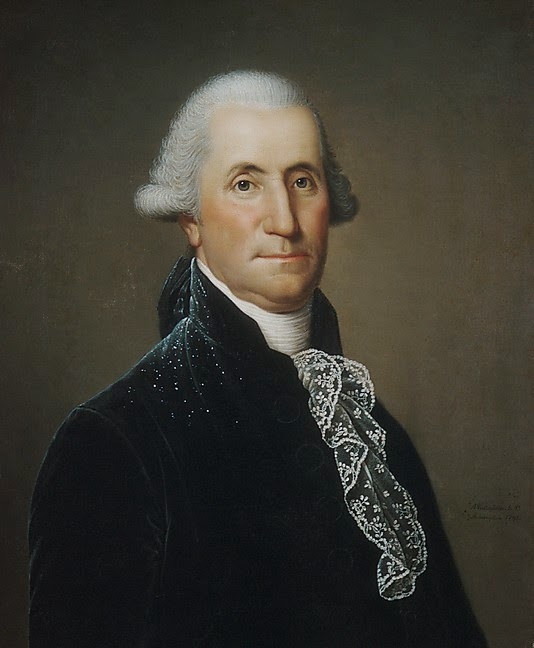 Ambitious of drawing himself into notice, he obtained the consent of Washington to sit for his portrait. It was, as usual, a highly elaborated painting, but dark in the coloring, and had a German aspect. It was but little admired, and soon ceased to be spoken of, or noticed in his room, where it hung between two open windows. When it disappeared there, I never heard where it had gone. It appears probable, however, that Washington took it and presented it to Mr. Oazenove of Geneva. It is, therefore, to be presumed that a portrait in the possession of Mr. Bogart, of Jamaica, Long Island (as I have heard), must be a copy of this portrait, which is now in the possession of Mr. O. A. Davis, a good engraving of which is prefixed to Irving's Life of Washington, where it can be seen, by those who are competent to judge, that there is some merit in the upper part of the face, but none of the character in the lower portion. 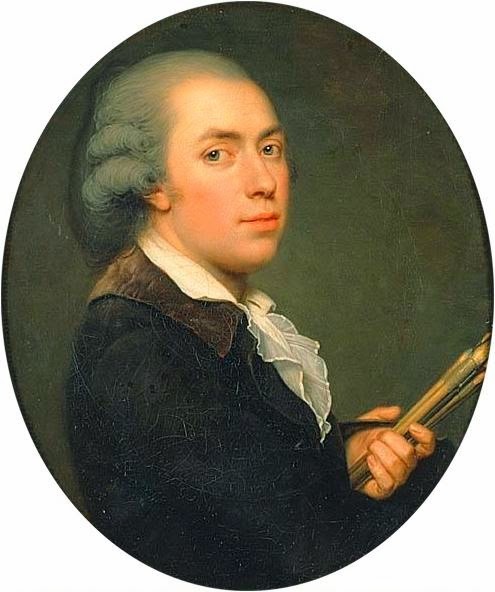 For several years Mr. Wertmuller made himself contented with little encouragement, being of simple and inexpensive habits ; but it was mortifying to see so good a painter employed as he was by William Hamilton of the Woodlands, in cleaning and repairing his collection of old paintings. It is not true that he copied the family portraits. Being obliged to move, Mr. Wertmuller found it difficult to suit himself with a painting room, the custom here not being, as it is in Europe, to affix written notices of " Rooms to let." He, therefore, in the part of the city where he wished to locate himself, went from house to house to make inquiries. A large house in Cherry Street attracted his attention, as having a good exposure. It belonged to a widow lady of some wealth, who had no idea of letting lodgings ; but the interesting appearance of Mr. Wertmuller induced her to acquiesce, and he actually was received as a lodger and boarder in the widow's mansion, and a few years after, became her affectionate and grateful husband. Disgusted with the little taste for the Arts, as shown in the city, the mild and amiable artist retired with his wife to a farm which she owned near Chester, and devoted himself to agricultural pursuits; but the fame of his Danae arose, and pursued him in his retirement, and hundreds of persons who neglected the opportunity of seeing his picture in the city, flocked to the farm-house, much to the annoyance of the painter, but to the profit of a neighboring hotel, where the company put up their carriages and dined — thus paying dearly for a sight which they disregarded when it could be had for nothing — the perverseness of fashion ! One Saturday evening, I was surprised by a visit from Mr. Wertmuller, who called to say, that since the public were now determined to see his picture, he had brought it to town, placed it in Cherry Street, the house being unoccupied, and he had advertised it should be open on Monday morning. I went with him to see how it was arranged, and found the picture, in a whitewashed room, with five windows, all open, placed on two carpenter's trusses, in the centre, and kept erect by ropes across the room ! I proposed to Mr. W., that if he would send a carpenter and some green baize, I would make a better disposition of it. I found the carpenter ready and a roll of baize at my command. The picture was placed against the wall, near an end window, half open, all the other windows closed. Baize over the wall and on the floor, and a curtain so that the picture, first seen in a large mirror (which I borrowed) in the corner opposite, could only be approached in the proper direction, and seen at a proper distance, regulated by a bar. At ten o'clock, it was already, and the first visitor was Mr. Wertmuller himself, who was astonished and delighted. Taking my hand between both of his, he expressed his earnest thanks, saying, " My dear sir, I 'never saw my picture before!" It looked, indeed, beautiful, and attracted much company, which I promoted by writing some paragraphs for the papers. • » . My picture gave me some reputation, and sufficient profit ; but, being sold a few' years after, it was destroyed by fire, from the carelessness of the exhibitor, in Broad Way. Wertmuller's Danae was bought by a company of five gentlemen at fifteen dollars. Mr. James M'Murtrie, of Philadelphia, was one of them, in whose possession I last saw the picture, a few years ago. 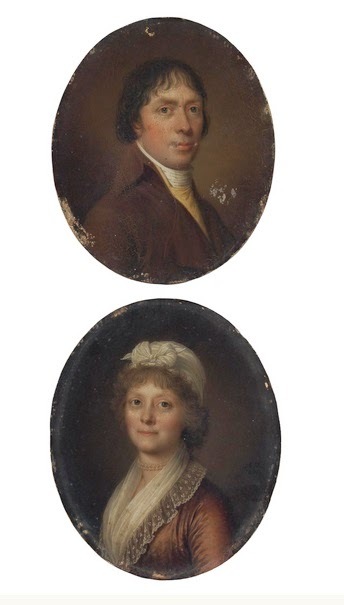 Sotherby's auction catalogue for the portrait of Wertmüller and his wife, sold 8th June 2007.